The graphics have been improved, taking on the appearance of Pokémon Ruby and Sapphire. The Pokédex has been enhanced. A new post-Elite Four area, the Sevii Islands, has been added. Certain Johto Pokémon can be found in this area. Several new minigames have been added on Two Island, as well as the Trainer Tower on Seven Island. Two new Key Items have been added: the VS Seeker, which allows the player to battle in-game Pokémon Trainer opponents again and again; and the Fame Checker, which displays information on the characters in the game. The list of available TMs and HMs has been upgraded to be compatible with Pokémon Ruby and Sapphire. Many new Move Tutors have been added, so that all moves that were available as TMs in Pokémon Red and Green are still available. New multiplayer features such as wireless multiplayer (with compatible hardware accessory), Mystery Gift, and Berry Crush. 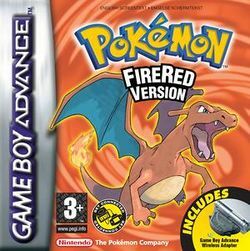 If connected to Pokémon Ruby and Sapphire, this game has the ability to fix the Berry Glitch in those games. This page was last edited on 14 July 2017, at 19:24. This page has been accessed 1,507,664 times.